MISSION, KS--(Marketwire - October 25, 2010) - (Family Features) Vampires, werewolves and monsters -- oh my! No, it's not the latest Hollywood blockbuster. It's Halloween. As little ghouls and goblins prepare to emerge into the night to claim their bounty of treats, it's important to think about ways to help kids enjoy this special evening and create memories that will last for years to come. And, though candy is certainly the treat du jour during Halloween, why not share a spooky and sweet treat with the special kids in your life that will last a lifetime -- and won't rot their little teeth? This Halloween, parents, grandparents and their little ghosts and goblins can participate in a new Halloween activity that can be re-lived every day of the year -- reading and recording their voices in Hallmark's new Recordable Storybook "We're Not Scared of Anything." "Research has shown that adults are looking for more ways to spend quality time with the kids in their lives" said Jonathan Bowyer, retail product manager for Hallmark. "Holidays, such as Halloween, are perfect opportunities for families to get together, and Hallmark Recordable Storybooks can help create holiday memories that last forever." Hallmark Recordable Storybooks feature an exclusive voice capture technology that records the reader's voice, which is then captured within the pages of book. When a page is turned, the Recordable Storyboo k automatically plays the text on that page in the reader's voice. The recording lasts for the life of the Recordable Storybook, and children who "read" the books can listen to their mom, dad, grandparent, aunt, uncle or friend read to them -- anytime and anywhere. Most titles in the Recordable Storybook line make great gifts to kids from grown-ups who cannot be present for story time (due to distance or other circumstances). But "We're Not Scared of Anything," one of Hallmark's newest Recordable Storybooks, is intended for two readers -- one adult and one child -- to read and record together. Though Halloween's thrills and chills are all in good fun, kids may still be a little scared of things that go bump in the night once the costumes are put away and the candy is all gone. "We're Not Scared of Anything" is designed to help address and calm these fears by putting the child in the shoes of a pint-sized monster. In the story, Little Monster, whose part is recorded by a child, finds plenty to be scared of as bedtime approaches. A "monster" under the bed and spooky things that creep make Little Monster too scared to sleep. Luckily, Big Monster, whose part is recorded by an adult, is there to reassure Little Monster that the scary things really aren't so scary after all. Try recording this story together for a unique bonding experience that will encourage a special child in your life and ease his or her nighttime fears in a fun and playful way. This unique reading experience, perfect for Halloween, can leave kids with a safety blanket of your voice. "We're Not Scared of Anything" also makes a great Halloween gift alternative for health-conscious parents who want to avoid a trick-or-treating sugar overload, but still give their children something to enjoy. In addition to this spooky delight, eleven other Hallmark Recordable Storybook titles currently are available in Hallmark Gold Crown stores nationwide. The collection features classics nursery rhymes, such as "Twinkle, Twinkle Little Star;" heartwarming original stories, like "All The Ways I Love You;" and, holiday titles, including "Frosty the Snowman" and "The Night Before Christmas." 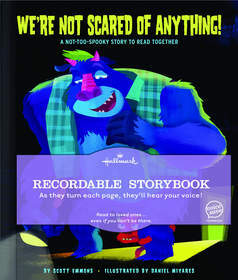 For more information about Hallmark's "We're Not Scared of Anything" Recordable Storybook and other titles in the collection, visit http://www.hallmark.com/recordablestorybooks.